Mumbai is a fabulous city in the state of Maharashtra that has a charm of its own and there is something about this city that simply satisfies your soul. While the real estate market in Mumbai is booming with a number of residential and commercial projects, a rise in property cost is very evident. Yet, the demand for property keeps increasing in Mumbai as it has a lot to offer its inhabitants in terms of education, job opportunities, lifestyle and more. There are a number of localities in Mumbai that keep growing in popularity these days and Kanjurmarg is one of them. Located in Central Mumbai, Kanjurmarg has come a long way over the years, offering buyers and investors the highest level of luxury and comfort without a heavy load on their wallet. This locality is filled with all that you need for a convenient lifestyle and the recently proposed metro lines (5th& 6th) in Mumbai has simply elevated the property demand in Kanjurmarg. With the 6th metro line connecting Swami Nagar to Jogeshwari, Kanjurmarg and Vikhroli, it that will link eastern suburbs to the western suburbs through 13 stations, decreasing commuting-time to a great extent and increasing the time you need to do the things in life that really matter. Although Kanjurmarg is a self-sufficient locality with fabulous social infrastructure, every day and emergency landmarks like schools, colleges, hospitals, bank, malls, shopping centres, cinemas and more, the new metro lines will only increase the popularity of this locality, gradually pushing real estate prices upwards. 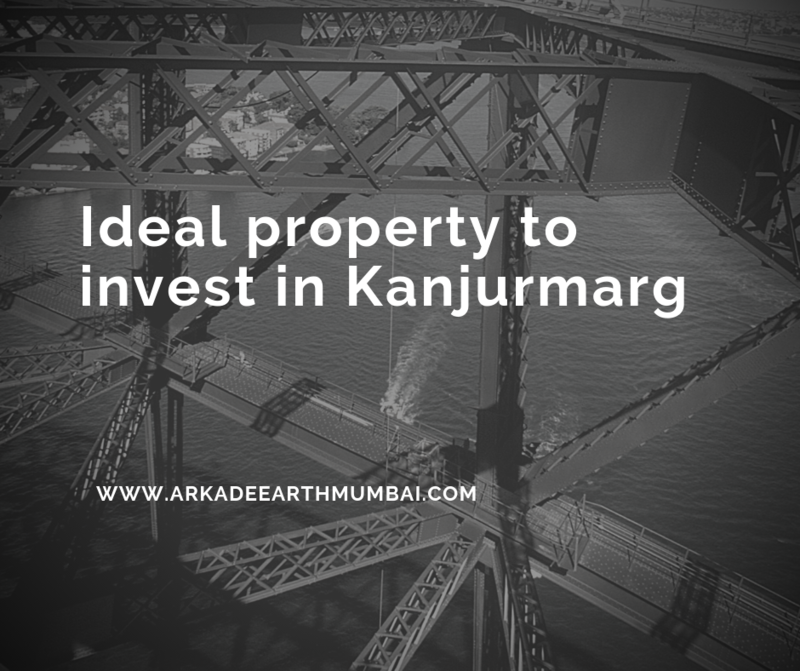 Now is the right time for home buyers and investors to purchase property in Kanjurmarg,as an increase in market value and high-end returns that will be seen in the days to come. Arkade Earth Kanjurmarg is one of the latest residential projects in Mumbai by Arkade Group that offers a life of high-end luxury and comfort that will blow your mind! Spread over 4 acres, this residential development offers 1BHK, 2BHK, 3BHK luxury apartments with carpet areas starting at 447 sq. ft. and going up to 1052 sq. ft. This development offers a modern-day lifestyle of peace and serenity in every corner!You will find apartments that are well-spaced and contain branded fittings & fixtures, vitrified flooring in master bedrooms, splendid kitchens with granite counters, strong doors, wide balconies and anodized aluminum sliding windows, intercom facility, hi-tech safety features and more. This development also offers a wide range of world-class external amenities that include a multipurpose hall, meditation centre, jogging track, multiple sports facilities and a play-area for kids, hammock garden, wide open space that will always make you feel free, Wi-Fi connectivity, theatre, ample parking space, herbal garden, efficient power back-up and well-trained security with video surveillance. Starting at an excellent price of Rs.92.60 lakhs and gradually moving up to Rs.2.08 Cr., the apartments at this development offer premium luxury without a heavy load on your wallet! You can choose from several payment plans along with home loan facilities, NRI services, customer support and more for a perfect purchase.